From left to right: David Immerglück, Coby Brown, and Jonny Flaugher. Photo by Jessica Klausing. Coby Brown treated fans to a beautiful, laid-back set in the intimate Second Stage Room at Hollywood’s Hotel Café on Thursday. Brown is no stranger to the Hollywood music scene. He’s a composer and songwriter who’s had his work featured in numerous films and TV shows; most recently he completed the score for the biopic, “The Man Who Knew Infinity.” Brown himself is a proficient performer. He exudes tremendous ease on guitar while his soft, pure voice delivers humble lyrics. 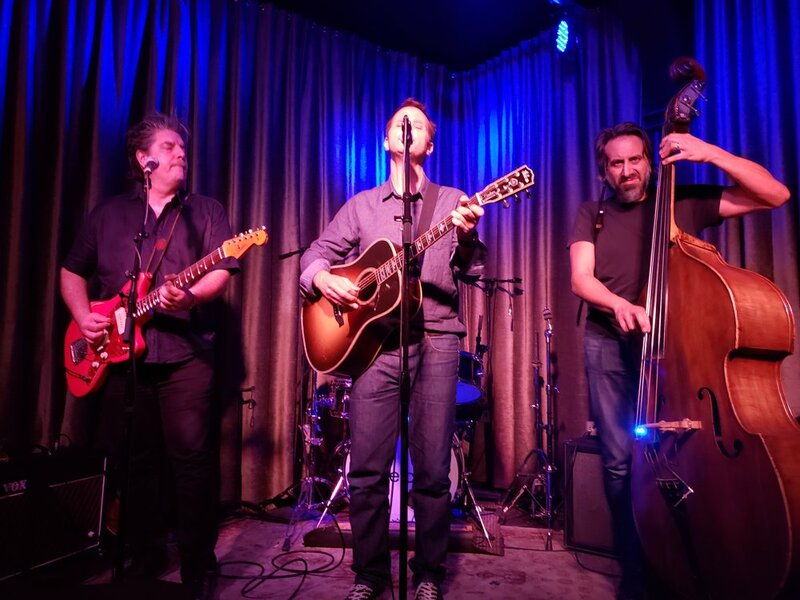 His band for the night – Jonny Flaugher (upright bass) and David Immerglück (guitar, mandolin, and backing vocals) play like they have been performing all their lives with Brown, moderating their instruments to keep the vocals in the forefront while laying down solos when called for. Jonny Flaugher photo by Jessica Klausing. Brown is an acoustic folk artist, but more importantly, he’s a keen observer able to capture the singer-songwriter genre in the personal stories the lyrics tell, and the sensitive, emotional accompaniment of his band. David Immerglück photo by Jessica Klausing. Coby Brown photo by Jessica Klausing. Brown closed with “Lived To Tell the Story,” a fitting ending to sum up his experiences to learn from past mistakes in order to move on. When the evening finally came to an end, Coby Brown and his band left to a roar of applause, ample evidence of a show well done. There’s a soothing sensation that hits you when they first start playing and a satisfaction when they end, and the time between those moments is filled with a sense of trying to make sense of all the loss and heartbreak in life. And for an evening, while we still may not be able to make sense of the pain, it’s comforting to know that things will be alright somehow. My friend Sandi and I made it to the American Beauty after catching a train and trekking through the rain. Side note: The venue's name is taken from the Grateful Dead's first album, American Beauty. Upon arrival members of the band came over to say hello to me. They all gave me a big hug and asked me how I was doing. Yarn's acoustic guitar player and harmony man Trevor asked me what concerts I've been to lately. We talked about bumping into each other at a Ryan Adams concert. I can't think of any other band, small or famous, who is that nice and down to earth. They genuinely care about you and make you feel welcomed. After I talked to the band I set up shop. I placed my book bag down on one of the couches which is off to the side of the venue and then wondered around. I got to watch a few innings of the Yankee game on the TVs' in the front bar. The venue is broken into two sections. When you first walk in you have a bar, some tables, and stairs which leads to the free pizza. Every drink comes with a ticket for free pizza. Beyond the bar is a set of doors which leads you to another room with a stage, couches, dancing cages, and another bar. It's a small cozy room with a great sound. At about a little after nine the lights went down and the house music came to a stop. The opening band Kevin Harrison & True North took the stage. I'll be honest and say I knew very little about them. I sampled one song before the show. They sounded like a cross between The Black Crowes and Rob Thomas. I know that's a weird combo. The guitars were a little Southern Fried Rock mixed with some Rob Thomas vocals. I only heard Rob on some songs but it was enough of a sample size to take notice. The band had a generic set up with two guitars players, bass, and drums. Nothing special or earth shattering. I perked up when they played a cover of "Midnight Rider" and some song about NYC. Before you know their set was over and the lights came on and the house music began to play. Ricky B plays the upright bass photo by Sandi Atkinson. Shorty after the opening band was done, Yarn made their way to the stage. They opened with a new unreleased song called "In the Moonlight." It's one of my favorites. Not many people in the crowd other then me knew this song. This fact did not matter because less then a minute into the song everyone was on their feet dancing up a storm. After that song came to an end the band played "Now You're Gone" off of the band's most recent studio album, This Is The Year. Some bands take a few songs to get warmed up. Not Yarn. They came out swinging from the minute they took the stage. They have so much energy. They literally play like it's their last show on earth. Yarn's bass player Ricky started out with his long hair tied back in a man bun, but as the night progressed on, his man bun came undone. His long hair started flying everywhere as he thumped on the upright bass. Sweat dripped everywhere! After playing more songs new and old the band had time for one more. They decided to throw out a curve ball. Yarn may be categorized as an Americana band, however, they are so much more. They effortlessly blend classic Country, Folk/Folk Rock, Singalongs, and Jams to create the Yarn sound. However this curve ball proved that they can also play some 70's Disco. That's right Yarn played a cover of KC and the Sunshine band's "Get Down Tonight." This song got the crowd in a frenzy. The place turned into a disco. Is there anything Yarn can't do? Once the song came to an end the lights came on and the house music began to play one final time. Before leaving the venue the band came over to ask me how I liked the show. Like a fine wine.... I swear this band gets better with each show. Unlike established bands who have roadies to set up and dismantle the stage Yarn has to do it all. This includes driving their own van and paying for gas and a place to sleep. They don't live in the lap of luxury and they truly do this for the love of the music. After a final goodbye I pulled a flyer off of the wall and headed back home. Go see Yarn if you ever get the chance. I guarantee you'll have a good time. If not your next drink is on me.